Bureau of India Standards (BIS) is going to conduct written examination for the recruitment of Assistant Director (Admn & Fin), Assistant Director (Public Relation), Junior Stenographer, Stenographer, Upper Division Clerk, Senior Technician, and Technical Assistant (Lab) posts on 21st February 2016. A huge number of candidates applied for these posts. All the candidates who had written the exam are searching for the admit card as it is the important document to carry for the examination and contains details regarding the exam venue, roll number etc. Aspirants who had applied can download the admit cards from the direct link provided below or from the official website. The Bureau of Indian Standards (BIS) is the national Standards Body of India working under the aegis of Ministry of Consumer Affairs, Food & Public Distribution, Government of India. It is established by the Bureau of Indian Standards Act, 1986. Every year it conducts various examinations for the recruitment of eligible candidates in various departments. This year it has released notification for the Stenographer/UDC and Technician posts. Candidates who had applied can download the admit cards from the official website. 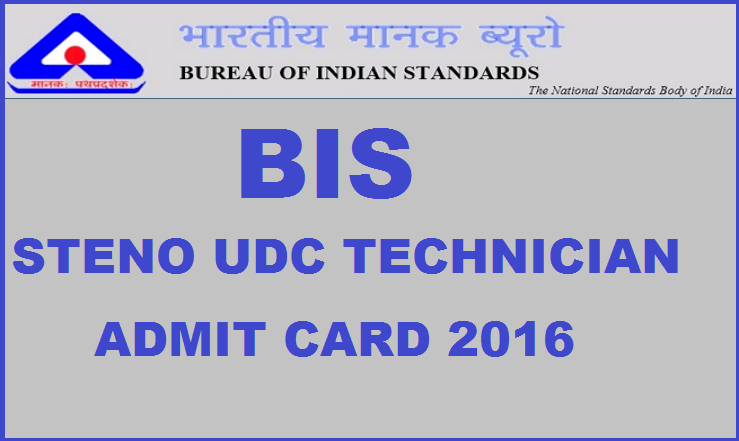 Bureau of India Standards (BIS) released the admit cards for the Steno UDC Technician posts. Aspirants who had applied can get the admit cards from the direct link provided below. Without admit cards aspirants are not allowed to write the examination and the candidates must download admit cards online as the hard copies are not sent to the candidates individually. Stay tuned to this website. We will update answer keys, results etc. Press CTRL+D to bookmark this page for easy navigation.